Sun City Center provides a relaxed and beautiful place to live or run your business, but this can’t be denied: Florida’s climate is hot and you need reliable and efficient air conditioning. Complete Pro Air can help you keep your place cool and comfortable whether you need a new air conditioning unit or need work done on the one you already have. New air conditioning unit installations. No matter what you need to get cool and comfortable air back into your place, we can help. We back up our work with a 100 percent satisfaction guarantee and take pride in fast and professional services. Just as you want your home or business to be cool and comfortable, you also need to feel comfortable with the people who come to work there. Our technicians are NATE and EPA certified so that you can feel confident letting them work on these important systems. We want you to have 100 percent trust in the people who we send to work on your air conditioning units. Every one of our technicians is background checked and drug tested before we send them into the field. We understand that your time is valuable. This is why we put a strong emphasis on on-time services. You don’t want to spend your days waiting around for an AC repairman, and we won’t make you. Temperatures can soar in Florida at any time of year. If your air conditioner is blowing warm air or not delivering an air current at all, you want someone out fast! We are proud to provide the speedy and efficient emergency air conditioning services that you need. Just call us and we’ll get someone out as quickly as possible. While air conditioners are designed to serve you for many years with regular maintenance, like other home equipment, they eventually wear out or become obsolete. 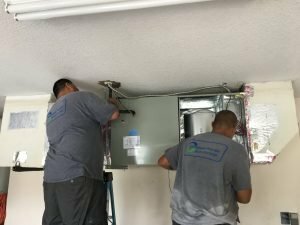 When an older unit is too expensive to repair or when it has become expensive and inefficient to run, it is time to look at new AC units. We provide free, no-obligation estimates on all air conditioning replacements. We give you the information you need to make an informed decision about how to keep your home cool and comfortable. There is no need to suffer in the Florida heat. We take pride in providing prompt, efficient and polite service. Call us today for the air conditioning services Tampa Bay trusts.